This is in response to your letter dated October 29, 1985, requesting confirmation of three items relating to the Hazard Communication Standard. 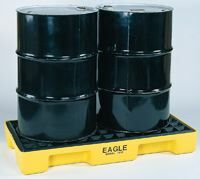 As you correctly stated, chemical manufacturers and importers must label containers of hazardous chemicals leaving their workplaces, and provide material safety data sheets with initial shipments by November 25, 1985. The requirements of the standard are not retroactive regarding material safety data sheets and labels. 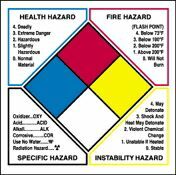 Labels should be put on imported hazardous materials as soon as practicable. Where the shipping container is a tank truck, rail car, or the like, the appropriate label may be provided with the shipping papers rather than posted on the container. It should not take beyond the first stop after the material leaves the pier to affix these labels. One label is placed on the outside of the pallet. Individual labels are provided for each of the individual bags sold to your customer. A determination is made that the customer did put these labels on. This procedure is limited to your present stock. All future stock should be properly labeled. If you have any further questions concerning the above please contact this office on (202) 523-8036. Like everyone else in our business we have run into problems interpreting this rule and putting it into practice. We have turned to your office for clarification and wish to confirm our understanding of the following points which were discussed with Mr. John Healy yesterday. If our understanding is not completely correct, please contact us. As explained to Mr. Healy we are importers and distributors. We are responsible for providing Material Safety Data Sheets and for properly labeling every order that goes out after November 25th. We are not responsible for MSDS and labels for orders shipped prior to this date. As we have no control over our overseas producers and can only request their compliance on labeling we asked the following question. If goods enter this country improperly labeled and we are the importer of record at which point must we affix the proper labels? As we understand it after discussions with Mr. Healey, we would be responsible for having the proper labels put on at the first stop after the Material leaves the pier whether this be at our warehouse or at our customer's facility. We are currently storing material in our warehouse, which is in bags, palletized and shrink wrapped. It is our policy to sell whole pallets. It would be very difficult for us to break the pallets to affix the new labels and we therefore inquired whether we could put one label on the outside of the pallet while it was in storage and ship it labeled in this fashion to our customer. Mr. Healy consulted with someone in your office on this matter and assured us that we could do this provided we sent along labels for the individual bags to our customer and followed up in a reasonable fashion (i.e. by telephone) to make sure the customer had put these labels on. Please contact us if our interpretation of the above points is not correct. We have also asked Mr. Healy to send us a copy of the OSHA General Industry Standards.